Hey! It’s another edition of Mixology Monday, and having sat out August’s entry on vodka cocktails, I decided to get back in the game this month with September’s theme, Dizzy Dairy. Led by group manager Chris Amirault (who this very evening is leading a cocktail class at Providence’s La Laiterie–go Chris! ), the eGullet team chose a dairy theme, interpreted broadly as anything you’d find in the dairy section of your local supermarket–milk, cream, eggs, soy milk, cheese, whey, curds, whatever. Now, I’ve had a bottle of Kahlua Coffee Cream sitting around for a few weeks now–a sample bottle that I received for review purposes. Kahlua Coffee Cream is a limited-edition product that will soon be released for the holidays. The bottle describes it as Kahlua’s coffee liqueur blended with cream. I could have simply built a cocktail on that cream component, but I decided that would be cheating and planned to add my own dairy-case ingredient. More on that in a bit. So starting with the Kahlua Coffee Cream, I figured I’d be going for a dessert drink. I’m sure that wasn’t necessary, but one thing I’ve never done around here is blog about dessert cocktails. The BarSmarts guys are pretty strong in advocating that bartenders have well-made dessert beverages to serve to restaurant patrons, and who’m I to argue with those gentlemen? My final inspiration here was Papa Clarke’s article in this weekend’s Chronicle about chocolate in cocktails. The very point of his piece runs contrary to what I’m doing, I’m afraid. His object was to show that chocolate need not be ghettoized as a sweet ingredient, and of course that’s just where I’ve relegated it. Chocolate in cocktails is more new territory for me, and so I’d rather blend for sweet than savory on my first go-around. A couple of ingredient notes. I decided to make this drink a flip, in part to sort of approximate the flavors of ice cream, and in part because I don’t make many flips. So of course my other dairy-case component is a whole egg. Also, I pulled this together very much at the last minute today. I wasn’t even sure what I was building until I started building it. So while the Bittermens Xocolatl Mole Bitters might have been a logical choice for this drink, I still haven’t picked up a bottle. 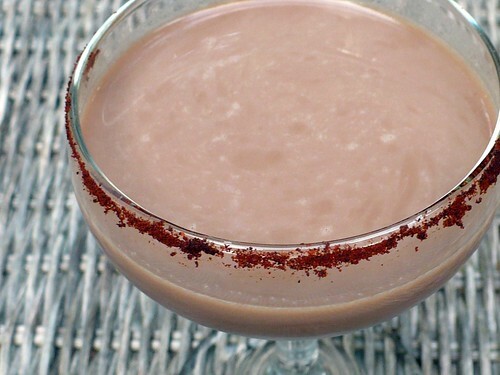 Add rum, Kahlua Coffee Cream, cinnamon syrup, bitters, cocoa powder, and egg to shaker. Dry-shake without ice to blend all ingredients. Add ice to shaker and shake again. Coat half the rim of a cocktail glass with chipotle. Strain cocktail into glass.